Kromeriz (German name: Kremsier) is a small city located in the province of Moravia in the southeast of the Czech republic. 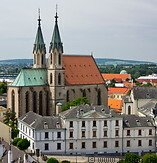 The city dates back to the 13th century, when it was founded by the bishop of Olomouc, Bruno von Schauenburg. After destruction by the Swedes in the 30 years war, the centre of Kromeriz was rebuilt in the 17th century primarily in baroque style. The beautiful historic core is centered around the market square, the bishop's castle and the flower gardens. The latter two have been listed as UNESCO world heritage sites since 1998.